Constantine: City of Demons is a well done entry into DC’s good animated movie line-up and features a great voice performance from Matt Ryan reprising his role from both live action and animated form. 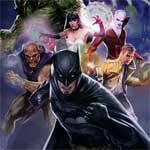 Justice League Dark is a middle-of-the-road entry into the DC Animated Universe. It’s also a bit inside baseball in that probably die-hard fans of the comics will get something out if it while others will find it crowded and the magical elements even made it harder to follow.